Blistering performances from Monster Energy Honda Team with the stage victory for Joan Barreda, plus fourth and fifth spots for Michael Metge and Kevin Benavides as the race moves on from Pisco. Joan Barreda gave a master class in speed with a commanding performance in the special stage. The Spaniard completed the course in 02:56:44 nearly three minutes less than the stage runner-up. 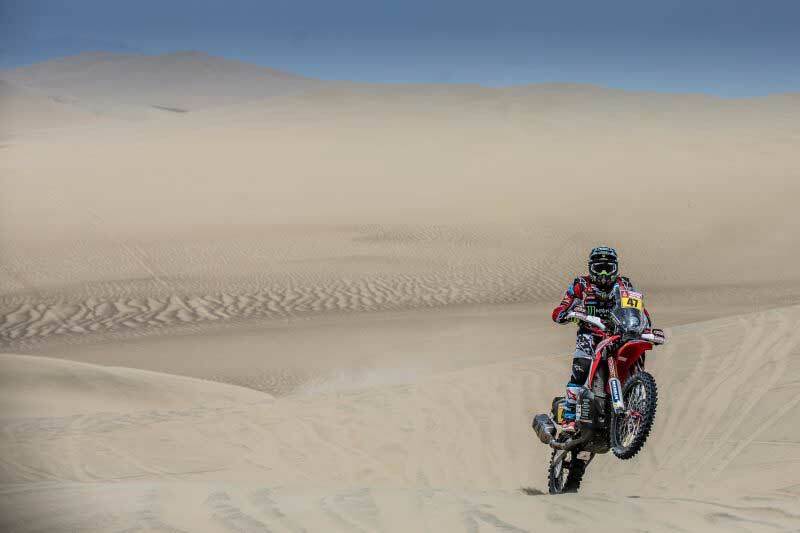 Barreda thus moves to the head of the overall leader board. "A hard, tough stage with quite a confusing part at the beginning where we had to keep our concentration," Barreda said after the stage. "I jumped a dune hard and I really felt that in my hand over the next few kilometres. The final part was very fast and I was able to pick up quite a bit of space and in the end it turned out well. Monday we have to open the track and everything changes again, but we always knew that it would be that way and we just have to keep on as best we can." Likewise, Michael Metge bounced back from Saturday’s delayed time to post a noteworthy result. The Frenchman looked at ease on the bike and scored fourth spot on the day and now holds ninth in the overall standings. "Pretty good today, right? In front of us the cars had marked out many ruts and it was difficult to climb the big dunes," he reported. "I think I took it quite easy and I tried to make sure I was on the right track. This is a great result after Saturday’s one, but we must be aware that the Dakar is long and anything can still happen." Meanwhile, Kevin Benavides also turned out a fine, almost effortless performance that stands him in good stead for tomorrow. The Argentine rider now lies in seventh overall position and will be able to attack from a strong starting position in a stage with very similar characteristics to those of today’s. Ricky Brabec finished the stage in twelfth spot and moves up one place in the general rankings to eleventh. The American rider got slowed up among some of the lost cars going in circles in the desperate search for some of the route’s more elusive waypoints. 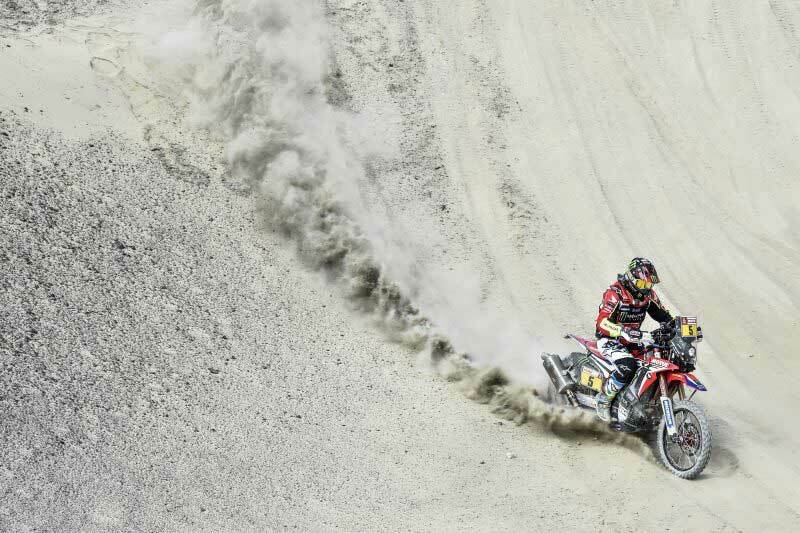 Finally, the stage proved to be another positive one for the surprising young Nacho Cornejo who appears to be taking well to the hand-me-down Honda CRF450 of retiree Paulo Goncalves. The Chilean finished in fourteenth and occupies the corresponding place on the overall leader board.